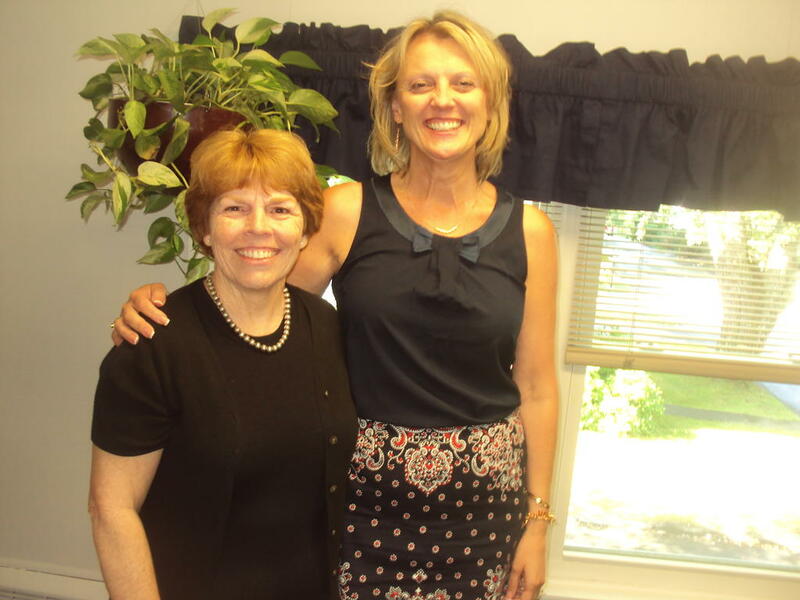 Becky Foley, left, the new superintendent in Regional School Unit 5, and Cynthia Alexander, the new assistant superintendent, know each other well from their time at School Administrative District 52, based inTurner. RSU 5 starts the year with a new superintendent, assistant superintendent and high school principal. With the first day of school in Regional School Unit 5 just three weeks away, new Superintendent Becky Foley has been scurrying around Freeport, Durham and Pownal, preparing for the new year. Foley, who worked as curriculum coordinator in the Portland School Department last year, met two weeks ago with another new RSU 5 administrator, Freeport High School Principal Jennifer Gulko. Foley and Gulko both have expertise in proficiency-based learning, which will be a graduation requirement in 2021 at Freeport High School. Foley also has met with the Freeport High School Building Advisory Committee, which is overseeing a $14.5 million renovation that, she said last Thursday, is 60 percent complete. She’s learning the who’s, what’s and where’s of the school district. Foley, 60, has a salary of $128,000. She is working with two new administrators, in addition to Gulko. Cynthia Alexander fills the new position of assistant superintendent, whose main responsibility is to serve as curriculum coordinator. And Charlie Mellon, who has been a social studies teacher at the high school, moves to fill the vacancy left by Gulko as assistant principal. Foley and Alexander are old colleagues, from their days in Turner-based School Administrative District 52, where Foley was assistant superintendent and Alexander was a principal. Alexander, 52, will earn $108,000 as Foley’s assistant. Working with Foley again will be good for both of them, Alexander said. Alexander, who lives in Auburn, spent 20 years in the Hampden school system and five in SAD 52. Foley is confident that Freeport High will be ready to meet the requirements for proficiency-based education, which is based on Common Core standards. The new class of eighth-graders at Freeport Middle School and Durham Community School will be the first to graduate under those requirements. Foley said that, when done well, proficiency-based learning empowers students to develop the critical thinking and skills needed to succeed once they leave Freeport High School. “This work will be one area of focus for this upcoming school year for staff,” she said. Foley also is intent on establishing a solid line of communications with everyone involved in RSU 5. While McDonough produced a superintendent’s newsletter, Foley has two different methods she will use to stay in touch. She said she prepares a weekly email update for the school board and is planning a monthly article for the community that would be published in the Tri-Town Weekly. RSU 5 has a strong administrative team, a strong teaching team and a school board that is committed to education, she said. An area of concern: a more cohesive mathematics curriculum at the middle school level. Programs for students at all three grade levels – 6, 7 and 8 – are created by different publishers, Foley said. 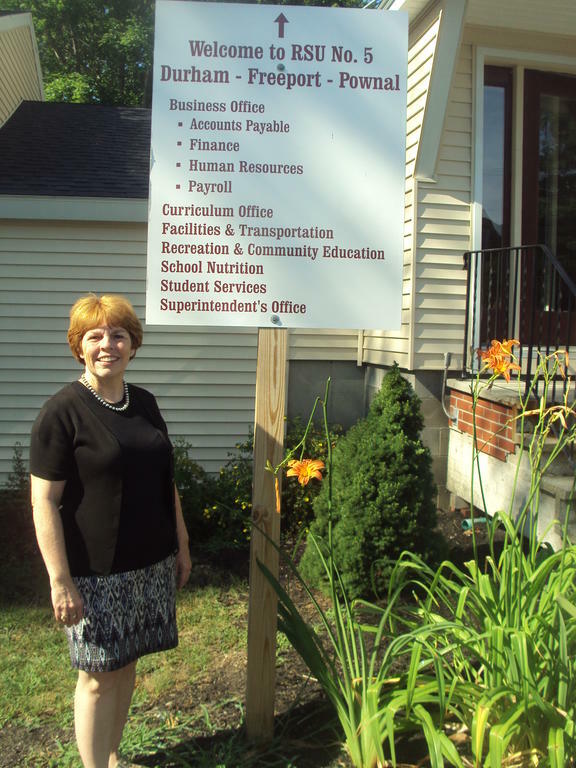 Superintendent Becky Foley stands outside the Regional School Unit 5 Central Office, which is getting a facelift this summer with new siding and windows. School in Regional School Unit 5 starts on Tueday, Sept. 6, for students in grades kindergarten through 9, and on Wednesday, Sept. 7, for all students.